Over the course of the semester I’ve been writing about developments in the streaming services sector of the music industry. These services have seen expansive growth in terms of revenue, but to date have been unable to make a profit. 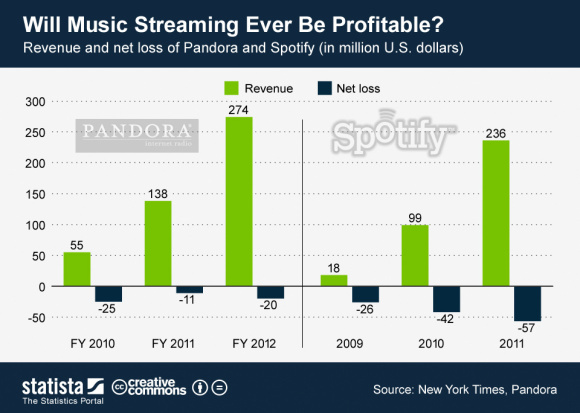 As discussed in many music industry news sources, Pandora is on an aggressive crusade to lower costs and payments to copyright holders, as they continue to suffer from huge net losses ($5.4 million net loss for the previous quarter). The company has raised significant opposition from many artists and other rights holders in their petition to Congress to pass the Internet Radio Fairness Act (IRFA) that would lower fees for the performance of sound recordings to that of cable and satellite radio. In a congressional hearing on Capitol Hill late November, supporters of the bill (largely technology venture capitalists) stated that reducing royalty rates for web radio would help artists over the long term by allowing the services to continue to grow. Law makers did not seemed convinced, an the bill currently seems have lost movement while congressional hearings continue. 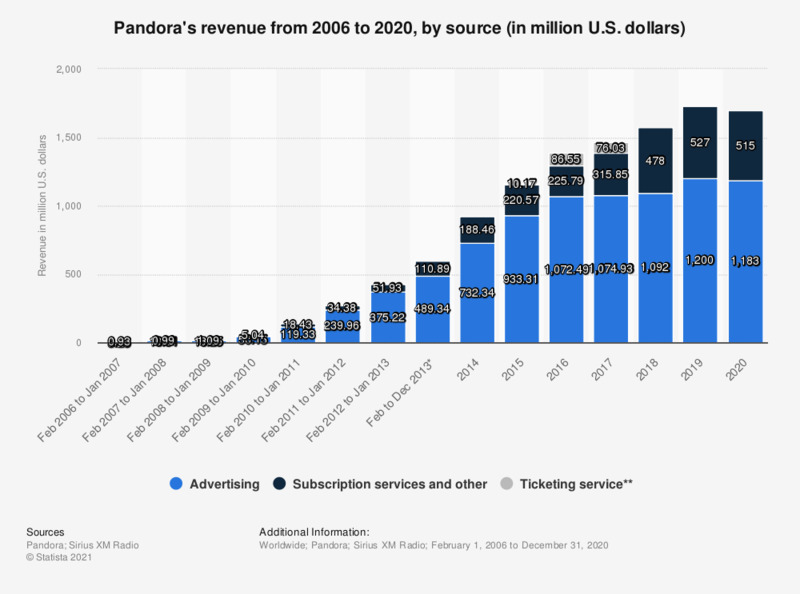 If Pandora continues to pay the current 60% of its revenue in royalties, many critics believe it will be impossible for the company to get their numbers in the black. Pandora has also began proceedings to sue performing rights organization ASCAP in hopes to lower performance royalties paid to ASCAP’S songwriters and composers for their works. In the lawsuit filed in early November, the non-interactive online radio service asked the court to set “reasonable fees and terms” through 2015, claiming that the original 2005 license they obtained from the PRO was “ill-suited and not reasonable.” The company points out that ASCAP changed it’s rules in April 2011, allowing members to withdraw certain licensing authority. Some members such as EMI have already taken advantage of this, and will negotiate a new media rights deal directly with Pandora. The future of Pandora seems to be greatly affected by the outcomes of these pleas of intervention from the judicial system. Lowering payments to artists and other rights holders may allow Pandora and similar companies to stay afloat but it is not a solution for the long term. A confidential industry source has leaked information to techcrunch.com writer Eric Eldon that Spotify’s financial figures in 2012 are suggesting that things may be looking brighter than expected for the company in the future – As covered in a recent post of mine, the service reported a loss of $60 million in 2011 from total revenue of $244 million due to large operating costs and other expenditures. The source has claimed that in just the first six months of 2012, the streaming service made $200 million in total revenue, with a projected end of the year revenue to clock in around $500 million, if current trends continue. Due to high licensing fees and other operating costs, the source suggested the company will likely post a loss of $40 million in 2012 at the end of the year. 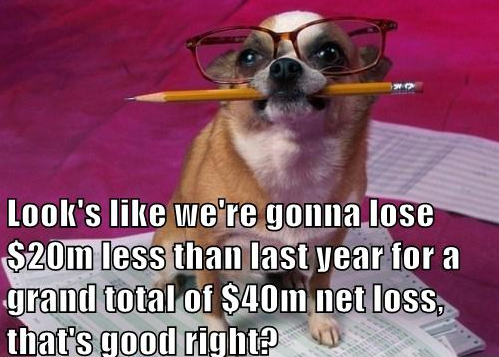 Losing $20 million less than the previous year sounds good, right? Prehaps to you and me, it’s not great news, however the company has received another round of funding to fuel ongoing growth and to cover losses, amounting to more than $100 million. The question it comes down to is whether or not the service can obtain enough paying users to make the service a sustainable, healthy company for the long term. Some argue that the future release of the browser-based version of the service could increase it’s user base, however growing competition from ambitious and expanding companies like Deezer, Rdio and WiMP make the glass look half empty. 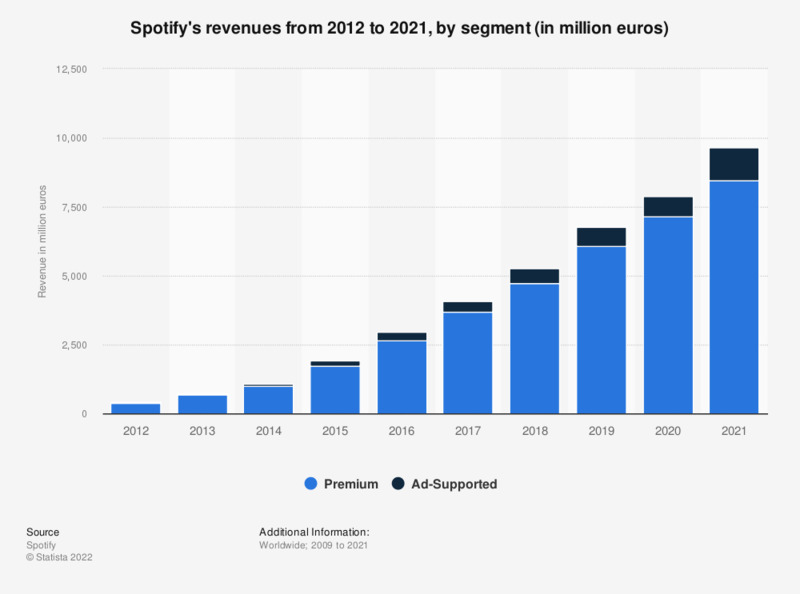 Do you think Spotify has what it takes to post a positive net income by 2017? Google Play limits you to upload 20,000 songs to the service for free plus songs bought in the Google Play store, whereas iMatch’s offer is 25,000 songs plus songs purchased in the iTunes store. Regardless, the difference of 5,000 songs seems hardly of importance when factoring the price structure of each. iMatch’s fee and limited nature makes it a hard choice to select in light of Google Play’s offer. It seams Apple will have to make some changes if it wants to stay competitive in this market. Spotify is popular – But will it be profitable? It isn’t clear whether Spotify will introduce a tired subscription system yet, the company is currently betting on turning free users in to paid subscribers. Entrepreneur and investor Sean Parker has predicted Spotify will take over iTunes in terms of revenue within two years, however this could be majorly derailed if the rumors around iTunes launching it’s own streaming service are true – An Apple streaming solution would be an undeniably hard competitor to beat in winning over the masses of consumers happy with their other Apple products. Paris-based digital music service Deezer recently announced $130 Million in its fourth funding round from Warner Music Group’s owner Access Industries, a multi-faceted holdings group in the natural resource and chemicals, real estate and media and telecommunications industries. Deezer appears to be gearing up to compete with Spotify on a global scale, however opting for a slightly different strategy – The company is currently targeting 200 countries world wide, many with few existing digital music markets, but staying away from the biggest piece of the pie (and also the biggest legal headache), the United States, at least for the time being. Deezer CEO Axel Dauchez stated in December of 2011 that “due to market saturation and low growth forecasts” along with the fact that the two represent only 25% of global music consumption, the company has decided to bypass them (U.S. & Japan)”, at least, for now. Nevertheless, within just five years, the five year old company has obtained 2 million subscribers and 7 million active monthly users compared to Spotify’s 4 million subscribers and 15 million active monthly users. With this new injection of funding, Deezer has announced a global strategy plan to become the leading digital-music service world-wide, representing 5% of the music market by 2016. Interestingly enough, Mr. Dauchez states the French company doesn’t see it’s competition as Spotify, but iTunes and piracy. What do you think? Is Deezer’s strategy to bypass the two largest music markets (United States and Japan) for now in order to concentrate on conquering smaller – but easier penetrable (both legally and financially) markets is a sound strategy? Does Spotify has anything to worry about? What should itunes be doing to compete with these streaming services? What does it means for the music industry now that major record labels are buying large shares in digital music companies like Spotify and Deezer? So many questions, and the story is still unraveling. – The free streaming service claims it is one of the largest digital music catalogs on the planet, going so far to boast that you can “listen for over 80 years and never hear the same song twice.” This may be of huge interests to current users of Pandora, sick of the same songs played over and over again on certain stations. Xbox Music will ship free bundled on every new Windows 8 PC. The basic paid Xbox Music Pass service will cost $9.99/month (similar to most other streaming services) and $99.99/year. Xbox Music will replace Microsoft’s previous failed attempt at the digital music sector, its Zune music service. Speaking of Zune, I find it hard for consumers to become interested in trying Microsoft’s new service because of negative associations with Zune. I find it likely that only consumers that purchase a new Microsoft computer may ever try the service, and only consumers that already have Xboxs may actually use the paid service. Also, I find the video very unsettling in terms of brand image and target market. The video feels very bland, uninspiring, and on top of this all, the unoriginal logo for the service makes an overall unenticing package – At least for me, personally (a Mac user, nonetheless). What do you think, does Xbox Music have a chance at the digital music market? During the first few times I posted here I wasn’t quite sure what my theme was going to be for the semester. I’ve decided to track and provide commentary on what’s going on in the digital music arena, particularly streaming services, applications and websites contending to win over the 21st century attention-deficit music fans who have a million of ways to choose from to access music. I think this is an important issue to follow because new developments in this arena are happening every day as consumers appear to be shifting more and more away from physical music formats, opting for digital ones. This first entry is about the streaming service Rdio.com, and their innovative strategy to lure paying customers to their service. It is too early to tell whether or not the program will be successful in the long run – This will depend on whether or not artists participate in the program and if the practice becomes popular with other artists over time. Well known artists such as Snoop Dogg, excuse me, Snoop Lion, Scissor Sisters and Chromeo are already participating in the program, however since these artists have a large fan base, it makes sense they would use the program). It is unclear whether the program is economically viable for the majority of artists without millions of fans, but time will tell…. Any more developments on this program will be covered in future blog entries. An underground revolution is occurring in the United States, gaining rapid popularity thanks to the Internet and increased flow of information and exchange of ideas. Thanks to the breakdown of the traditional music structure, new genre movements like this one have been able to flourish by connecting directly with fans. Bedroom producers, small and boutique label producers have figured out an addictive, head-nodding music formula by taking successful elements of Electronic Dance Music and Rap, throwing them in a musical blender, creating what I’d like to call “Thug Rave”. These producers are experiencing rapid success, performing at sold out festivals, and some attracting the attention of suits at major labels trying to catch on to the tittle wave of attention to this new phenomenon. (An alternative Soundcloud link has been provided because the group was forced to take the track off their official page due to copyright infringement claims surrounding the vocal samples. Nevertheless, the track made its way to the public, becoming one of the most played songs in many rap and electronic DJ sets in the U.S. this year). As you can hear, these producers combine strong synth leads with heart pounding 808’s, spastic yet perfectly executed snappy pitch-modified snares and vocal clips, and other elements from the typical Southern Crunk drum kit. The result are a new breed of catchy, high energy tunes that have developed a strong enthusiastic following, successfully building on the foundational blocks that EDM and Rap have provided. This phenomenon has existed for less than two years, but it will be interesting to see how it progresses, and whether or not the genre will eventually gain mainstream exposure. In a world of corporate buyouts, mergers, and partnerships of huge media conglomerations, it’s no doubt that competition is tough for indie labels with big dreams. When cash is king, how do smaller labels manage to take home their slice of the pie? Today I’ll be looking at an American label that has become a tastemaker on a global scale in just five years from its inception. Based out of Philadelphia as the brainchild of hyperactive non-stopping producer, DJ, songwriter, rapper, author and filmmaker Diplo (Whomas Wesley Pentz), Mad Decent is constantly pushing the limits and perceptions of what a record label is and how it should function. For new labels, here are lessons to be learned from this forward thinking creative platform. 1. Let talent and taste guide you, not norms. Baile Funk (Blonde de Rolê), Dancehall (Major Lazer), Progressive Kuduro (Buraka Som Sistema) and Post Trap (Flosstradamus, UZ) are just some of the genres housed under Mad Decent. The label goes for sounds that feel like night and day when compared side by side. The reason? Diplo strongly feels the organization shouldn’t limit itself to one genre, but rather approach acquisition of artists based first and furthermost by talent and innovation, no matter what the category may be. “The business side that I see from Mad Decent is that they reinvest to create a happy environment for people to release their music,” Bot says. “It’s about growing and building, and supporting new artists. That’s by far more interesting than the traditional label model of ‘let’s make the most money we can.’” – Andrea “Bot” Fratangelo, one half of Mad Decent production duo Crookers. 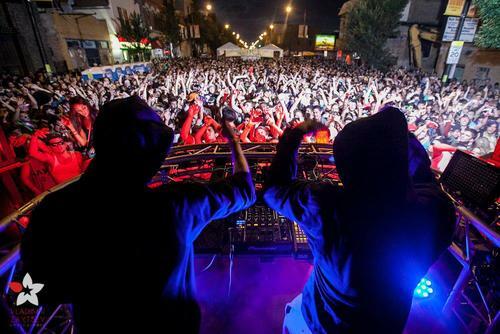 Mad Decent Block Parties have taken over neighborhoods across the United States in the past few years, offering free entry and showcasing the label’s established artists and new talent. This summer’s Chicago block party was so popular that fans rushed the barriers and the event was shut down due to over-capacity. Free events like this help build loyalty of long time fans and attract new ones at the same time. A little good will never hurt an organization’s image, either. Heaps Decent is “committed to finding and nurturing the creativity of underprivileged and Indigenous young people and emerging artists.” The Austrailian-based non profit organization co-created by Diplo provides resources to help talent develop their musical careers and promote creativity.